It's 10:58 in Sydney, Australia right now. Port of Sydney A video of the port of Sydney, taken from the rooftop of the Four Seasons Hotel and refreshed several times per day. Sydney: Sydney Opera House, 0.4 miles away. Sydney: Sydney Harbour Webcam, 0.4 miles away. Sydney: Harbour Bridge - Bridge Deck, 0.4 miles away. Sydney: Harbour Bridge / Opera House, 0.4 miles away. Sydney: Rose Bay, 0.4 miles away. Sydney: Weather in Potts Point, 0.4 miles away. Sydney: Weather in Ultimo - Ultimo Sky, 0.4 miles away. 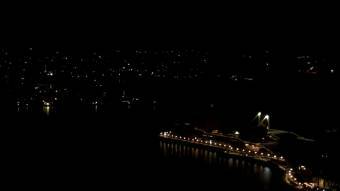 Sydney: HD Panorama Harbour Bridge and Opera House, 0.4 miles away.